Something over five years ago, I wrote a post, Planet Fret, in which I pointed out that oil is probably not finite and that using it at the rate that we are is probably not leaving a good legacy for our children. One thing that I almost entirely failed to mention in that post is of course the potential damage to the environment in terms of global warming. Much of the blame for that omission is due to my living in the US at the time. In the US, many of the oil companies have spent significant amounts of time and money leading the general public to believe that climate change is not only not-man made, but actually does not exist at all. Any variations are purely down to cycles, rhythms or bad data. 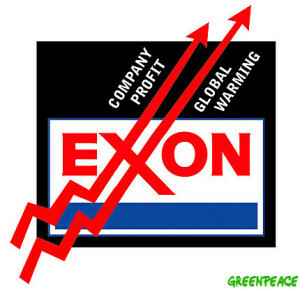 Recently it was announce that the NY Attorney General is looking into claims that Exxon Mobil flat out lied to the general public and investors about the threat of global warming. Along with Peabody Energy, the world’s biggest private coal company, they are collectively accused of funding groups that obfuscate the issue around the damage to the environment that burning fossil fuels causes. Lets step back a little. Burning fossil fuels, coal, oil derivatives, wood or well, most things, produces byproduct of the combustion in the form of Carbon Dioxide. This is a colourless, odourless gas that naturally occurs in the atmosphere. It is harmless. Unless of course you consider that CO2 is a ‘greenhouse gas’. A gas that that absorbs and emits radiation within the thermal infrared range. The best way to think of this is that these gases trap heat from the sun that would not otherwise be trapped. The primary greenhouse gases in Earth’s atmosphere are water vapor, carbon dioxide, methane, nitrous oxide, and ozone. Without greenhouse gases, the average temperature of Earth’s surface would be about 15°C colder than the present average of 14°C. The more greenhouse gasses you have, the higher the surface temperature becomes. One of our neighbouring planets, Venus, has a very significant greenhouse gas ‘problem’, the atmosphere of Venus is primarily CO2. The surface temperature is around 467°C. But, back to the Earth for a moment, the planet that we call home. Since the beginning of the Industrial Revolution, the level of CO2 in the atmosphere has risen by about 40%. In 1750, the concentration, which is measured in ppm (Parts Per Million) was around 280ppm. Currently the concentration is around 400ppm and rising. The main cause for this rise is of course Human activity, we burn an awful lot of coal, oil and natural gas and have embraced the concept of ridding our plant of forests. All of this ‘extra’ CO2 is causing our planet, our home, to heat up a little. Well, ‘little’ is actually relative, we are about to cross a threshold, it is the 1°C threshold. This may not sound significant. But, given that at the current level of atmospheric CO2, around 400ppm, CO2 is contributing to about 15°C of warmth. The calculation is not linear, you cannot, for example, say that each ~27ppm is worth 1°C in temperature change. If we could, we would set a worldwide CO2 target and stick to it. The target would be considerably lower than the current 400ppm, in an ideal world it would be closer to the 280-300ppm range. However this is going to take a considerable amount of effort. It would require that everyone makes significant changes to their lifestyle. If we are to address the temperature rises, we need to reduce our CO2 output. Power production accounts for a significant presentation of the CO2 in our atmosphere, coal and gas fired plants account for an estimated 35-40% of the gases. A shift to wind, wave and solar power, along with storage facilities will not mitigate the damage, but it will reduce the impact for future generations. Industrial processes take up the next largest chunk of blame. Much of this usage though is back to the power plants, so assuming we can get the power production problem solved with renewable, clean energy sources, then we could / should be in good shape here. The third problem is transport. Gasoline is incredibly convenient as a fuel. It is easy to transport and store and our personal transport is easily re-filled. It is also horrible for CO2 production. At this point it does not matter if we are at ‘peak oil’. It does not matter if we have 30,40,100 years worth of oil still available in the ground. We simply need to stop using it. Actually we really should have stopped using it back in the 1970’s, when Exxon and the other oil companies became aware of the impact that they product was having on the world. But profits dictated that there was no way that the truth would become public. In many ways this is like the Tobacco ‘problem’, whereby the giants of the tobacco world understood the health risks, then spent billions of dollars denying that cigarettes were in any way responsible for cancers, all the while reaping the rewards from the death of their customers. Well, ‘Big Oil’ and ‘Big Coal’ are similar merchants of death, they have spent considerable time, effort and money ensuring that the public is not aware of the damage to the world, while accruing incredible profits. The truth is out there, Fossil fuels need to go the way of the dinosaur. But the impact on our lives will be considerable. Power production is probably solvable, we already have nuclear, wind, wave and solar available, battery technology and water pumping for hydro-electric will pretty much take care of peak demands. Transport, though, really needs a change of attitude. Five years ago I worried that we were using fuel too quickly, now I worry that we use it at all. The entire car ownership model probably needs to change, cars as a status symbol is an outdated and stupid idea. I am more impressed with those that have smaller, more economical cars than those that drive ‘gas hogs’. Public transport, telecommuting and perhaps cycling should be the order of the day. Not single occupant 6000lb 10mpg SUV’s. What it will really take though is a shift in public perception. Perhaps the investigation into Big Oil and Big Coal will be that start of that change. Our children can only hope…..